Here at SLV.Global we aim to facilitate our sessions and activities, with the exception of our English teaching sessions, using non-verbal communication. 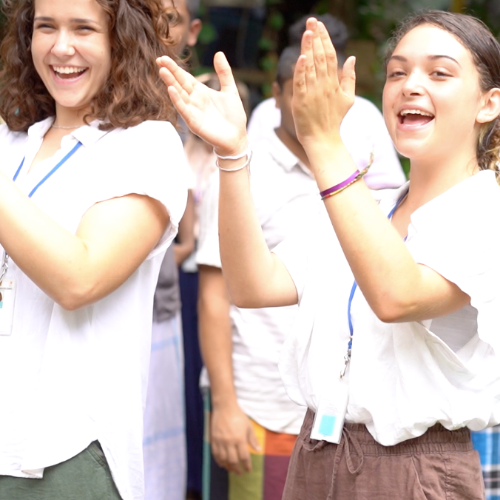 Our group therapeutic activities in Sri Lanka and Indonesia are designed to provide a supportive and open atmosphere for service users utilising non-verbal exercises to help promote cognitive function and reduce reliance on spoken language. We encourage use of body language and facial expressions to communicate meaning and direction within sessions, whilst providing valuable positive feedback to service users through clapping and cheering where appropriate. By abstaining from using verbal communication, the potential for misunderstanding due to language barrier, is reduced and an atmosphere of trust, greater understanding and unity is fostered between facilitators and service users. Although working this way has its challenges, it’s worth the extra effort to avoid causing any undue distress by speaking excessively in a foreign language at service users. Removing the element of spoken language instantly puts everyone in the room in the same situation and is a great equaliser. Through patience and demonstration, service users are often able to grasp the purpose of a task far more quickly than they would if it were to be explained using words. In Jessica Lankin’s 2006 paper, Automatic Cognitive Processes and Nonverbal Communication, it is reported that “mimicking others and being mimicked can communicate rapport automatically.” Therefore, by removing language and facilitating sessions using a fair amount of demonstration, repetition and mimicry we seek to build up a natural rapport with service users. This same research suggests that “people can pursue a goal to develop rapport or liking by mimicking the behaviors of others automatically.” Meaning that by achieving the desired outcome of the task through imitation one often achieves positive feelings of success and accomplishment. There has been much research into the topic of nonverbal communication and its various components and benefits. Beginning with Charles Darwin’s 1872 publication “The Expression of the Emotions in Man and Animals”; in which he argued that all humans show emotion through similar behaviours, and that emotion itself had an evolutionary history that could be traced cross-culturally and between species. Since this publication, there has been a growing body of research on unspoken communication; with many different types of nonverbal communication being identified. Body language, facial expressions, gestures, posture, eye contact, are all crucial in communication. Volunteers keep their posture open and friendly and bring themselves to the same level when working with service users. Appearance of an individual (hairstyle, clothing, choice of colour etc. ) is thought to be a means of nonverbal communication, which can alter physiological reactions, judgements, and interpretations. Culture is important on how appearance is judged. Our dress code promotes professionalism whilst respecting the local communities where we work. Distance maintained by a person whilst communicating. The amount of space we need and we perceived to have, can be influenced by social norms, situational context, cultural expectations, and level of familiarity. Here we can ensure we control the layout of the room to make the environment as open and inclusive as possible. The volume, tone of voice and pitch used. We can control the tone and pitch of our voice during activities to communicate meaning and emotion. The use of touch in communication - there has been a substantial body of research into the importance of touch in communication. Volunteers may choose to shake the hands of staff and service users or give a high five to the kids at the end of the project. Of course, when working cross-culturally one does need to consider that certain gestures may have different meanings. For example, in the Indonesian culture, the left hand is considered ‘dirty’, so it would not be appropriate to use this hand for a handshake. Similarly, an open-palmed pat on the head is often viewed as a sign of fondness in Western cultures, whereas, in Sri Lanka, it is a Buddhist belief the top of the head is the highest point of the body - where the spirit exists. Therefore, this gesture would be seen as highly invasive. It is important to recognise these gestures and cues, and to have an awareness of them when living and working in different countries. However, once one is aware of these potential faux pas, the positives of working non-verbally far outweigh the potential pitfalls. NVC is an essential element of patient-centered care. It provides an inclusive environment for all service users where all are able to participate, irrespective of their language ability or if they are non-verbal. It can help to enhance interpersonal competence, and promote desirable social skills. NVC can provide a method to express or convey information about internal emotional states. It can help to regulate the flow of verbal communication by providing feedback to the other person. NVC can reinforce the therapeutic relationship and help build rapport between a caregiver and service user. It is a positive way to reinforce mutual understanding and respect. It does not require a shared common language between two people. NVC can also be used in risk management, as having situational awareness of service users negative nonverbal reaction can help in predicting and preventing possible stressors. It is clear that there are many benefits of non verbal communication. Being skilled in these methods of communication can provide an individual with interpersonal soft skills which are highly transferable and valued within the workplace. For those wanting to work as a Mental Health Support Worker, the NHS require competencies in the applicants' exchange of “factual information with clients using persuasion, tact, reassurance, empathy and acknowledging barriers to understanding”. “Effective communication skills” are listed on the personal specification for Trainee Clinical Psychologists. In addition, the Nursing and Midwifery Council identifies non-verbal communication as a tool, stating that nurses should “use a range of verbal and non-verbal communication methods, and consider cultural sensitivities, to better understand and respond to people’s personal and health needs”. This also applies to the educational environment; Special Educational Needs (SEN) Teaching Assistants are required to “recognise signs of distress in children” and “promote the acceptance and inclusion of the pupil with SEN”. In conclusion, we have highlighted some examples of how powerful working without words can be, and the benefits that working without language can have to the service users within multiple contexts. Not only this but, an individual skilled in these methods of communication will develop crucial skills transferable to the workplace and in that individual's personal development.